but this is not possible, nor is it expected, of everyone. The public is welcome to observe daily puja. 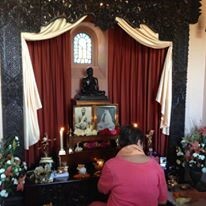 It is an excellent time to sit in the temple for meditation. Here are the steps to a simple daily puja, courtesy of Swami Tyagananda of the Ramakrishna Vedanta Society in Boston, MA. The vesper service is known as arati, the Sanskrit word for light. It is a quiet time, a time for reflection and meditation at the close of the day. During the ritual, five items, representing the subtle elements that form the universe, are offered back to the Lord. The ritual symbolizes the multiplicity of the world being dissolved into oneness. It is an act of surrender to God, an act of the soul’s return to its Source. 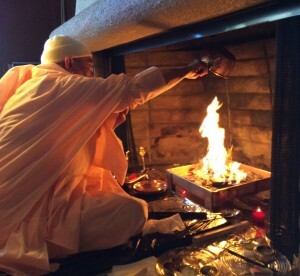 After a brief meditation, the worshipper begins the arati by lighting wicks in a special holder. These wicks are made of cotton dipped in melted ghee (clarified butter). The lights symbolize the light of Brahman (the Godhead). They also symbolize fire, one of the five elements that comprise the universe. The worshipper pours consecrated water three times over the handle of the arati holder as salutations are offered to the fire that is Brahman. Pouring the water three times is believed to aid the worshipper’s commitment to the act, thereby enhancing the effect. The worshipper rings the bell continuously with the left hand, symbolizing the mystic sound OM, which eternally reverberates throughout the universe. With the right hand, the worshipper waves the light clockwise before the pictures of Ramakrishna, Jesus and Buddha, thus offering fire back to the Lord. The worshipper then kneels down and passes the right hand over the light and then over the head. By doing this, the worshipper is purified by the light of Brahman and takes the darshan (blessings) of the Lord. This act also signifies the desire for illumination, or for realization of the soul’s oneness with God. The worshipper then pours water over the hand as an act of purification before the next, and each subsequent, offering is begun. The second offering is water, which is contained in a conch shell. Water is another element comprising the universe. The conch is waved in a circular motion before the holy pictures, and is then poured into an offering bowl. The third offering is a cloth, which symbolizes the element space. Cloth covers the body as space envelops all creation. The fourth offering is a flower, symbolizing the element earth. The last of the offerings is the chamara (a fan made of yak tail), which symbolizes the element air as it is gracefully waved before the holy pictures. Three songs accompany the vesper service: Khandana Bhava Bandhana, a Bengali song to Sri Ramakrishna written by Swami Vivekananda; Om Hring Ritang, a Sanskrit hymn to Sri Ramakrishna written by Swami Vivekananda; and Sarva Mangala Mangalye, a Sanskrit hymn to the Divine Mother. Some temples recite “Breaker of This World’s Chain”, an English translation of Khandana Bhava Bandhana by Swami Prabhavandna and Christopher Isherwood in lieu of singing the Bengali song. The singing is often acccompanied by a harmonium, an Indian hand-held organ. Vespers begins at the close of the day, near the time of sunset, and are followed by a period of silent meditation. See the local Vedanta Centers for times. All are welcome to attend.